Blog on WordPress, Blogger and Medium like a Pro. 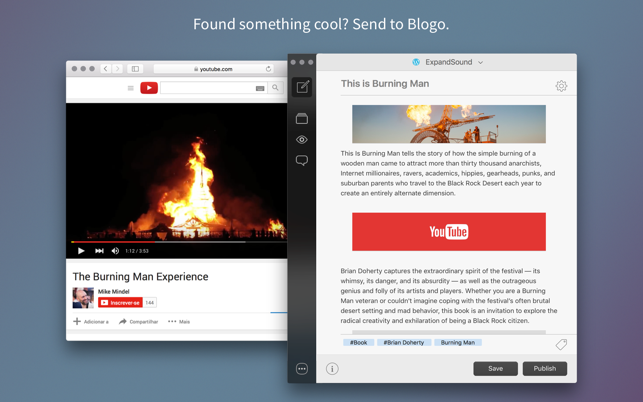 Blogo is a blog publishing app that helps content creators to focus on what matters most: publishing the next story. 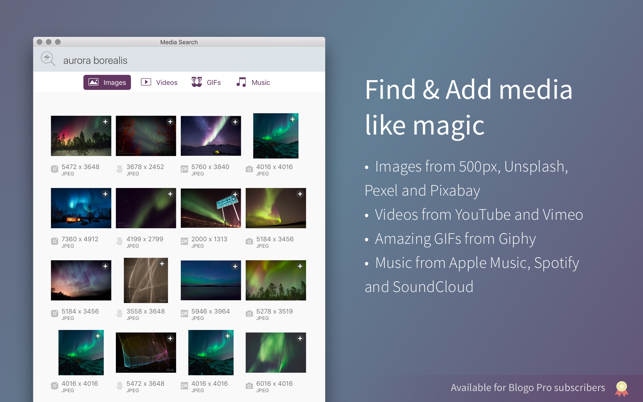 Blogo is now available for iOS! 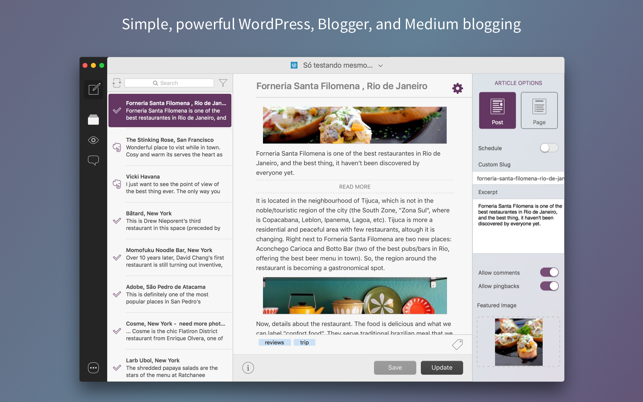 Use Blogo on the Mac, iPhone or iPad and keep all your publishing preferences in sync. Visit getblogo.com and get it free! Hey guys! It's been far too long since our last update, and we apologize. We're hoping this will be the first of a string of updates, and we'll do our best to keep them coming as often as we can. Fixed: bug with headings inserting a line of code. Fixed: bug with Heading sticking to H3 and not letting go. Optimized: WordPress platform checking - in cases of websites without stress (graphic accentuation) or ascii. We'll be back with more ASAP! There are a few things that need work. Right off the top of my head, there are only three sites that work with blogo. This should open up to more. I used to have an older blog that was my own, not affiliated with the 3 sites it offers and I couldn’t use it. Bummer. Next, there’s no spell check. I think blogo should integrate that. Lastly, and I have a Medium account, so I can’t speak for all the sites, and it only happened once (I’m not willing to try it again), but when I underlined a word in a paragraph and then published, upon checking the site I discovered anything after the underlined word in that paragraph was missing. 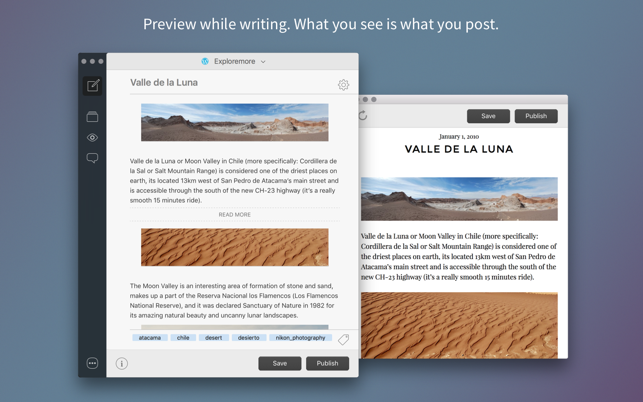 Other than those things, I think it’s a really fun app, that you can write, save, publish all from your desktop. That’s the great thing about apple products. It’s not all about the browser, but rather the experience. Thank you for all your compliments! We love to hear what our users think! We are working on integrating with other platforms, most likely beginning with Tumblr. It's just taking us a little longer than we wanted due to the slimming down in crew we had this year. Regarding spell check, we are facing a bug with it but our devs are already working on a fix to send as soon as possible. We deeply apologize for that bug that happened to you! We haven't heard of anything like it before, so if it happens again, please, contact us so we can look into it! If you have any other suggestions or comments, we'd love to hear them! I saw really good reviews for Blogo around online and decided to give it a shot. I really enjoyed its simplicity upon first use and liked that its focus was on writing, while maintaining all the bells and whistles neatly tucked away. It could definitely use a few more text editing tools (like text alignment), but the writing experience allowed me to keep focused on what I was doing. The major caveat and dealbreaker here is that it does not feature any sort of autosaving. This is something that I believe we’ve all come to expect with modern software. After 3 hours spent writing a post, I clicked on the Save button and was presented with an upsell to sync to Evernote. I passed on that, and then after I clicked on New Post and returned to the one I had just saved, I came to the horrifying realization that nearly everything I had written was gone. It felt like I was back in the 90s and had accidentally kicked the power cord on my desktop before hitting the Save button. This was truly disappointing to say the least. Now excuse me while I go try to reconstruct those 3 hours of work again. Hi Luisten! First, we'd like to say we're deeply sorry about your content loss and for taking a while to reach out to you. There is an autosave and if your post disappeared it was probably a bug, so if you can get in touch with us through https://helpcenter.getblogo.com we can help try and retrieve it. Once again, we're very sorry you lost your content. Thank you so much for your compliments, we're really glad to hear them as it's exactly what we aimed for. I began using Blogo to store blog post ideas, but I started noticing that every now and then I would go to delete a post and when I click confirm, a different post becomes highlighted and deleted. 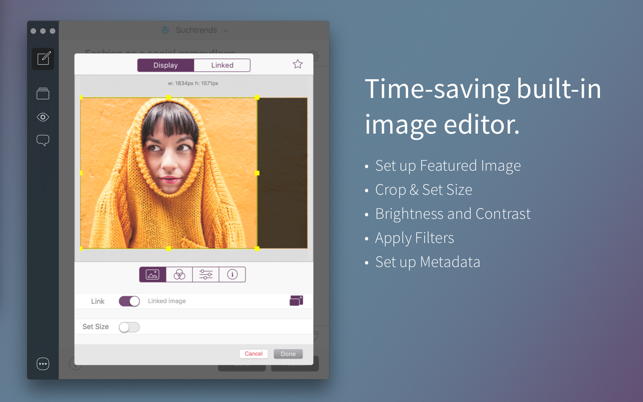 I immediately copied over everything to Evernote and stopped using this app. I had great post ideas being deleted that I would have loved to keep. Before the deleting fiasco, I found that after I set up Blogo to sync with my Evernote, if I moved from post to post, the updates I made were not always being saved as I clicked around. I had to manually sync the post to evernote to make sure that I wouldn’t lose the updates I was making. I am not one to leave reviews, but losing my writing in two different ways is just bad programming. Inexcusable. Hi Alina! We're so sorry to hear about your content loss! We agree it's inexcusable, and we'll do our best to fix these issues. However, they seem to be very random, as we constantly test our product and haven't faced either of them. If you have the time, we'd love to get more details on the issues so we can try to reproduce them and find a fix!